The Fish teams are the Vodacom NXTL champions as they each walk away with a bursary after a 2-1 victory over the Radebe Team. “If feels good to be named the Man of the Match, it wasn’t an easy game but we believed in ourselves that we can win the game. We fought as a team till the last whistle. My dad even came to support me. He had tears in his eyes. Tears of joy. They say a man don’t cry but a happy man who is proud of their kids does. I’m having an emotional evening. All thanks to God,” Selota said. The Fish team came flying out of the blocks and went 2-0 up after just 30 minutes of the game, with the youngster controlling the game from the midfield. “The coaches always encouraged us to never give up during the match. Portia Modise always pushed me to my limit. She believes in me and I couldn’t disappoint her or myself. It wasn’t easy as you know most of the Radebe team players are older than us. They have the power and energy. So all we had to do was to out think them. Play with them mentally. The coaches gave us the brains which led us to this victory,” he added. 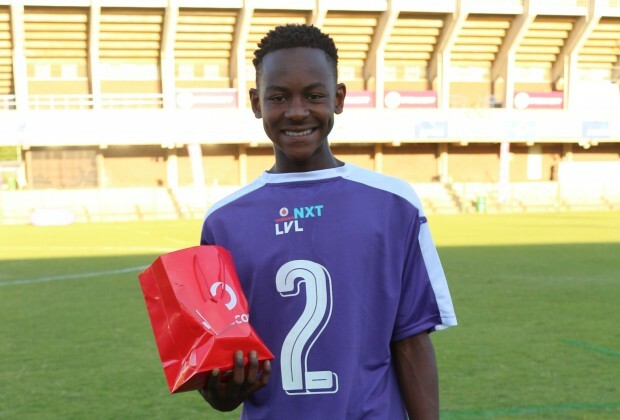 “I’m very grateful for what Vodacom has offered to us. Now I know I have a bursary and it will help me a lot with school and my football career. What I have learned today is that hard work truly pays off. From now on I’m going to work hard on anything that I want. “God is good at all times. Thanks to all my coaches. I love them so much.” he concluded.